What versions of core and Pipeline plugins are running? Is the jenkins.io job "running"? That is, the job itself blinking etc - if it is, then it's stuck on executing part of itself, but if it isn't, then it's stuck even before that. Andrew Bayer added a comment - 2016-05-10 16:10 A few questions - What versions of core and Pipeline plugins are running? 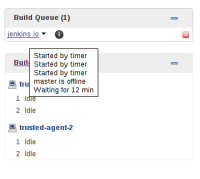 Is the jenkins.io job "running"? That is, the job itself blinking etc - if it is, then it's stuck on executing part of itself, but if it isn't, then it's stuck even before that. At first glance, I can't see how it'd ever have "master is offline" as a blocked reason (https://github.com/jenkinsci/workflow-job-plugin/blob/master/src/main/java/org/jenkinsci/plugins/workflow/job/WorkflowJob.java#L314) but I may be missing something. Jesse Glick, any thoughts? Andrew Bayer added a comment - 2016-05-10 16:17 At first glance, I can't see how it'd ever have "master is offline" as a blocked reason ( https://github.com/jenkinsci/workflow-job-plugin/blob/master/src/main/java/org/jenkinsci/plugins/workflow/job/WorkflowJob.java#L314 ) but I may be missing something. Jesse Glick , any thoughts? JENKINS-7291 should ensure master always has a computer. Daniel Beck added a comment - 2016-05-10 16:37 JENKINS-7291 should ensure master always has a computer. Both you and Daniel Beck have access to this instance, you can "see" it live, but as this is a managed host, please refrain from tinkering settings and whatnot. R. Tyler Croy added a comment - 2016-05-10 17:12 Andrew Bayer , the Environment section of this JIRA has the information answering question number one As for the second, this is a Multiibranch project. The "master" branch "job" is not blinking, and the "jenkins.io" folder is not blinking either, though I don't think it does that Both you and Daniel Beck have access to this instance, you can "see" it live, but as this is a managed host, please refrain from tinkering settings and whatnot. I have never heard of this problem before, and have no idea offhand how it could occur, since as Daniel Beck notes, there is always a MasterComputer even if you have configured zero heavyweight executors—WorkflowJob uses flyweights. As far as I know I lack administrative access to the server in question to do any live debugging. Jesse Glick added a comment - 2016-05-10 19:52 I have never heard of this problem before, and have no idea offhand how it could occur, since as Daniel Beck notes, there is always a MasterComputer even if you have configured zero heavyweight executors— WorkflowJob uses flyweights. As far as I know I lack administrative access to the server in question to do any live debugging. Jenkins.instance.selfLabel.offline, which should never be possible. Jesse Glick added a comment - 2016-05-10 19:57 Jenkins.instance.selfLabel.offline , which should never be possible. Jesse Glick We learned a few hours ago that master was marked offline due to disk space, and since it has zero executors, it wasn't apparent from the UI (as an executor-less master isn't shown on the executors pane). For some reason that offline state was preserved across restarts, and apparently longer then disk space cleanup + 30 minutes for the next monitor run, so maybe something was wrong there, but that was the offline cause. Daniel Beck added a comment - 2016-05-10 21:13 Jesse Glick We learned a few hours ago that master was marked offline due to disk space, and since it has zero executors, it wasn't apparent from the UI (as an executor-less master isn't shown on the executors pane). For some reason that offline state was preserved across restarts, and apparently longer then disk space cleanup + 30 minutes for the next monitor run, so maybe something was wrong there, but that was the offline cause. Looks a lot like Not A Defect to me. If the master is offline (especially for disk space reasons), no need to run any builds anywhere. The only RFE I could think of would be to not hide the executor-less master node in the executors sidepanel if it's marked offline. Daniel Beck added a comment - 2016-05-19 11:36 Looks a lot like Not A Defect to me. If the master is offline (especially for disk space reasons), no need to run any builds anywhere. The only RFE I could think of would be to not hide the executor-less master node in the executors sidepanel if it's marked offline. Sounds like a core bug. Jesse Glick added a comment - 2016-05-19 17:35 Sounds like a core bug.